Glenn is a secondary school teacher in Hertfordshire UK where he has been collecting Doctor Who ever since chancing upon Tom Baker shopping in London's Covent Gardens several years ago. Glenn has loved the series since he watched his very first episode in 1963 as a 7-year-old boy. 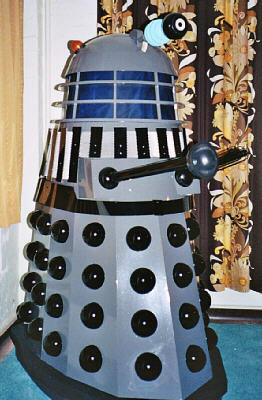 He became fascinated with the Daleks and has remained so until this day. 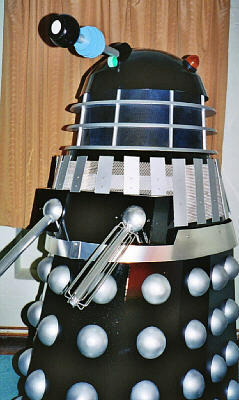 He now has two full-sized Daleks built for him by Julian Vince of "Dalekmania" and "More Than Thirty Years in the TARDIS" fame. One is a gray and black version and the other a Dalek Supreme. 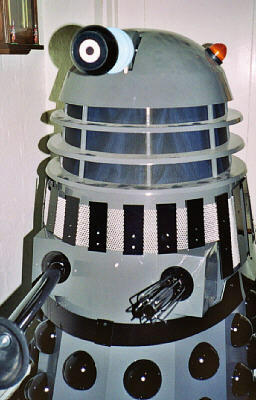 Glenn has many other Dalek versions including Sevans, Comet and Arc Daleks. Not constrained to just Daleks, he has acquired other villains from the show including a Cyberman helmet, a Sevans Cybermen and Ice Warrior, many DVDs and videos, books, autographs (including Sophie Aldred's first Doctor Who autograph after having recently gotten the part of Ace). All of the pictures on this page are the property of Glenn Christodoulou and may not be used or reproduced in any way without his explicit written consent.